This is another of those articles that encourages food lovers to do things they've always wanted to do, but have shied away from because they think they aren't talented cooks or they don't have enough time or it's just too difficult and tedious. Making jams and preserves doesn't have to be hard. Oh sure. It conjures up images of pioneer women or depression-era housewives perspiring over boiling kettles and having to sterilize all those jars. Well, you can just relax. You can do this, and without a great deal of effort. And the rewards are terrific. Not only will you have preserved the best of the summer fruits for your own enjoyment, but you can make quite impressive gifts of your handiwork to friends and associates that will be appreciated and long remembered. You can purchase a large canner, one of those dark metal ones with the white flecks, for very little money at most any KMart, WalMart or even hardware store. For the jams and preserves discussed in this article, you need not sterilize your jars. If you have a dishwasher, just wash the jars you are about to use and leave them in the dishwasher until you are ready to use them. If you do not have a dishwasher, just wash them by hand with hot, soapy water, and rinse in hot water. The rule is that jars need not be sterilized if the food in them is processed for more than 10 minutes. 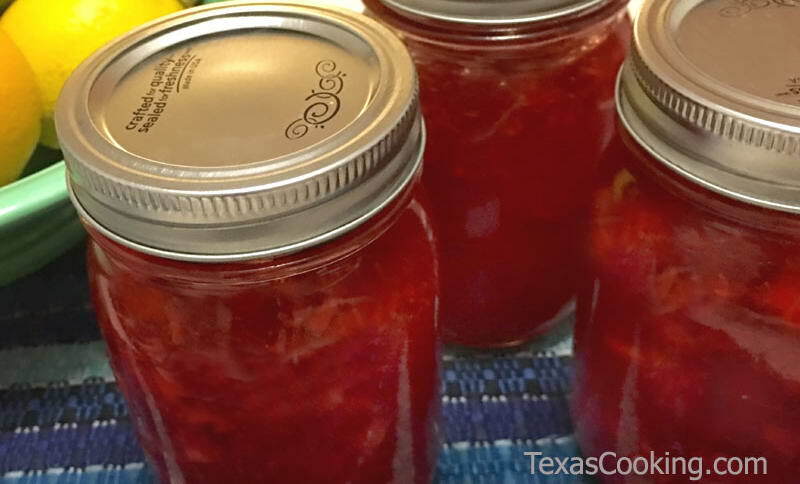 One of the following recipes, Easy Strawberry Freezer Jam, will not require any special equipment, other than the jars. And do not think that it is any less delicious because it hasn't been fussed over. The idea here is to get you to act. The following recipes for Peach Preserves, Watermelon Rind Preserves (something a little different), and two kinds of Strawberry concoctions, Grandma's Elegant Strawberry Preserves and Easy Strawberry Freezer Jam, will not take that much of your day to prepare. If you are a veteran preserve maker, you may find these recipes ridiculously easy. If, however, you are a novice or you haven't "put up" anything in many years, I believe you will actually enjoy making these jams and preserves. I know you will enjoy them in the months ahead. Combine peaches, lemon juice and pectin in a large pot or Dutch oven. Bring to a rolling boil, stirring gently. Add sugar and return to rolling boil. Boil hard for 1 minute, stirring constantly. Remove from heat. Skim any foam. Add almond extract at this point, if desired, and mix. Pour into hot jars, leaving 1/4" head space. Adjust caps, and process 10 minutes in boiling water bath. Makes about 6 12-ounce jars. To prepare the watermelon rind, trim the green skin and pink flesh from thick watermelon rind. Cut into 1-inch pieces. Dissolve salt in the 8 cups of water and pour over the rind. Let stand 5 to 6 hours. Drain, rinse and drain again. Cover with cold water and let stand 30 minutes. Drain. Sprinkle ginger over rind; cover with water and cook until fork-tender. Drain. Combine sugar, lemon juice and 6 cups water in a large pot or Dutch oven. Boil 5 minutes; add rind and boil gently for 30 minutes or until syrup thickens. Add sliced lemon and cook until the rind is transparent. Pack hot into hot jars, leaving 1/4" head space. Remove air bubbles. Adjust caps. Process 20 minutes in boiling water bath. Makes about 6 half pints. Combine strawberries and sugar in a large, heavy saucepan or Dutch oven, and allow to stand for 3 to 4 hours. Bring mixture slowly to a boil, and stir until sugar is thoroughly dissolved. Add the lemon juice, and increase heat to high. Boil rapidly until strawberries are transparent and syrup is thick (about 12 minutes). Remove from heat, and skim any foam from surface of mixture. With a slotted spoon, remove the strawberries from the syrup and place in a shallow container. Return the syrup to heat, bring to a boil and cook for 8 minutes. Pour hot syrup over strawberries. Cover container loosely with a clean tea towel, and allow to stand in a cool place for at least 12 and not more than 24 hours. Skim any foam from surface. Do not stir mixture, but shake it occasionally so strawberries absorb the syrup and be distributed evenly. Pour into hot jars, leaving 1/4-inch head space. Adjust jar caps, and process for 20 minutes in boiling water. Makes about 5 half pints. The key to lucious strawberry preserves is using the most perfect strawberries available. Use ripe, but not overripe, berries. Do not use overly large berries, or those with hollow cores and white, pithy centers. Combine strawberries and sugar in a bowl. Allow to sit for 20 minutes or so, stirring occasionally. Combine pectin and water in a saucepan, and bring to a boil. Boil for 1 minute, stirring constantly. Stir the pectin into the strawberry-sugar mixture, and continue stirring for 3 minutes. Pour into wide-mouth freezer jars, leaving 1/2-inch head space. Adjust caps, and let stand until set, but no more than 24 hours. Freeze. Makes about 5 half pints. Once thawed, these little pints of freezer jam will keep for about 3 weeks in the refrigerator. I really encourage you to give this a try. Make a few pots of jam, and you will see that it is not so challenging a task. Then you will have your feet wet, so to speak, and you will be eager to delve more deeply into canning and preserving and the related articles which will appear in these virtual pages in the months ahead. Readers will also be interested in Cheryl Hill-Burrier's article on canning and food dehydrating.